There is nothing groundbreaking about seeing Captain America fight Iron Man, just like there is nothing groundbreaking about seeing Captain America’s bulging biceps as he holds down a helicopter with his bare hand. But there is something groundbreaking about a franchise of films that, after almost a decade, continues to be exciting and far from being worn out. Marvel relies on an effective formula and an assortment of compelling superheroes to tell simple, yet absorbing and entertaining stories with a lot of action. “Captain America: Civil War” could not fit this mold more perfectly. There is nothing novel about “Civil War,” but there never had to be. The main source of contention between Captain America and Iron Man is rather down to earth for the Marvel Universe. After the devastation of Sokovia in “Age of Ultron,” world governments come together to call for limits on the autonomy of the Avengers. While Iron Man tries to convince the Avengers to accept this oversight, Captain America argues against it, unwilling to be subject to the control of political forces. The feud between the two escalates further when Captain America tries to help his friend Bucky Barnes, the Winter Soldier. There are no world ending events or overpowering bosses to fight, just human conflict interwoven with espionage and politics. Like “Winter Soldier,” the newest Marvel installment contains twists, set ups and satisfying reveals throughout the film. However, the concept behind “Civil War” is innovative in this new superhero-saturated world since these heroes are shown to be fallible and may put you at odds with your favorite Avenger. 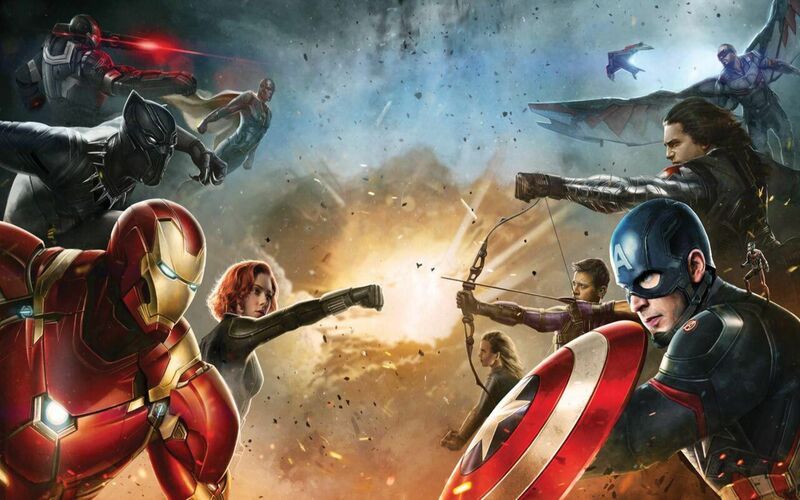 As is promised by the title “Civil War,” the film features plenty of super heroes clashing against other superheroes. The sheer number of heroes dwarfs that of “The Avengers,” which at the time of its release, had dwarfed every Marvel movie before it. But taking place in the Marvel Cinematic Universe has its narrative advantages, as “Civil War” doesn’t need to waste time developing the vast majority of its characters, and any new characters are quickly integrated to make time for more superhero action. There were a few unnecessary additions included only for the sake of fan service and spectacle, but thankfully, the film avoids spreading itself too thin by focusing its attention on the two super superheroes, Captain America and Iron Man. Indeed, “Civil War” is too light on its feet to ever feel bloated. Worth noting is the new incarnation of Spider-Man (Tom Holland). His character was quickly introduced in one scene and then immediately brought into the action, and already his character is more witty and likeable than the previous Spider-Men. Of any Marvel movie, “Civil War” most clearly reveals the studio’s prowess at juggling dozens of comic book characters and bringing them to life with ease. Because of the continued luster of the two main characters and the great action set pieces that Marvel is known for, “Civil War” proves to be another exceptional addition into the Marvel pantheon. The studio has proved that being fun and formulaic are not mutually exclusive. “Civil War” is not novel, but it’s not played out. It’s a Marvel superhero movie in which Captain America gets to go up against Iron Man, and there is no better way than this to launch the summer movie season.